We only had time to explore a small part of the Cascade Lakes Scenic Byway, but we stumbled upon what must be one of the most beautiful parts of Oregon. We stayed in a National Forest Campground at Elk Lake (#9). We kayaked at Hosmer Lake and Sparks Lake. We hiked at Devil's Lake and Sparks Lake. On a clear day you can see the snow-capped peaks of Mt. Bachelor, South Sister, and Broken Top reflected in the lakes. The byway was originally paved with red crushed lava rock, and some of the side roads still are. Volcanoes and glaciers carved this area. Elk Lake where we are camping looks like a good kayaking lake too. and powerboats. We chose the smaller, quieter lakes to kayak this time. And as promised, the day for kayaking Sparks Lake was clear and the water calm. South Sister and Broken Top mountains. Birdie will be practicing with the kayoo again today. Off we go exploring around the rock formations. That is Mt. Bachelor in the background. We can hear the water gurgling through cracks and crevices in the lava. There is a passageway here through large lava formations. Not a good picture, but two sand hill cranes just flew by on the other side of the lake. Warning: This post may cause scenic overload. Stop looking if you start to feel symptoms. Wild flowers growing out of cracks in the lava. I call it God's Little Rock Garden. There just aren't any words...except maybe ooh and aah. Through the passage and on to explore more of the lake. Even the downed trees are beautiful. 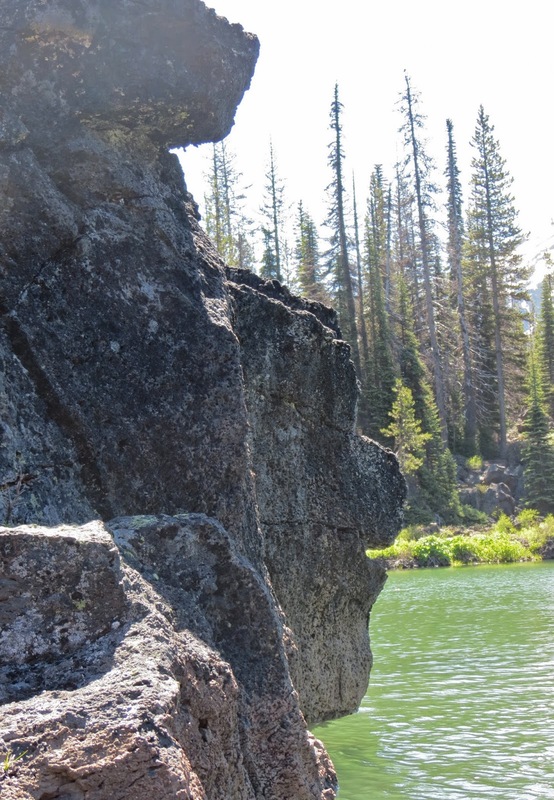 More rock formations to paddle around. Another view of Mt. Bachelor. Someone is camping on the lakeshore up ahead. I guess campfires are allowed here. A face in the rock. A stop for lunch and a stretch. We had some guests for lunch. Do you see who's coming up behind Birdie? Our lunch spot is sometimes used as a campsite. The fire ring is in the water...water is high now, but becomes shallow during the summer and fall. Birdie spotted the Bald Eagle. Swimming hole...do you see the jumping off rope hanging from the log? The water is pretty deep here. Birdie spotted a deer ahead to the left of the tall green tree. A young buck getting a drink. Heading back to the boat ramp...we'll have this view all the way. We are starting to see more kayaks. This couple have attached their canoes together with a trolling motor between them. One advantage of paddleboards...naps on the water. A LOT more kayaks...glad we came early and it's a good time to leave. Although we had to wait awhile to use the ramp. This marshy area is the other end of the lake where Soda Creek flows into the lake. We didn't get to this part today...next trip. Those are Canada Geese on the grass. If you ever travel this way with a kayak...this lake is a must-do! What a beautiful tranquil relaxing paddle. Good thing you got out early and beat the crowd but I guess that is just an indication of what a great lake it is for paddling.